Attorney: Action is in "best interest of both his family and the people of Secaucus"
(CNN) -- A New Jersey mayor who was one of 44 people arrested last week in a federal public corruption investigation resigned Tuesday, according to his attorney. 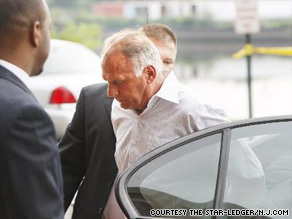 Dennis Elwell, shown being led into a courthouse Thursday, had been mayor of Secaucus since 2000. The resignation of Secaucus Mayor Dennis Elwell is effective immediately, attorney Thomas Cammarata said. "After careful deliberation, Dennis determined this action is in the best interest of both his family and the people of Secaucus," said a statement from Cammarata. "Those who perceive this action to be an admission of culpability as to the pending criminal allegations are gravely mistaken. Dennis pleaded not guilty to the charges, is presumed innocent and will vigorously defend the unproven allegations made against him." Elwell, 64, a Democrat, had been mayor since January 2000. He is president of a family-owned trucking company, where he and his wife both work. He is a decorated Vietnam combat veteran, according to the Secaucus town Web site. A political consultant who was also among those arrested in Thursday's federal sweep was found dead in his home Tuesday evening, Hudson County Prosecutor Edward DeFazio said. The cause of Jack Shaw's death is unknown, though homicide has been ruled out, DeFazio said. An autopsy is scheduled for Wednesday. "This is just another strange twist to a very disgraceful story," DeFazio said. Other city leaders arrested in connection with the investigation include Ridgefield, New Jersey, Mayor Anthony Suarez, 42, and Jersey City Deputy Mayor Leona Beldini, 74, prosecutors said. Authorities alleged the dozens of public officials and associates -- including five rabbis charged with money laundering -- exchanged hundreds of thousands of dollars in bribes. According to court documents in the case, Elwell is charged with accepting $10,000 from a confidential informant.